It’s time for the Outdoor Play Party! Today is Summer Solstice and what better way to celebrate the longest day of the year than by heading outside. With summer, comes summer sports. My youngest daughter plays soccer, my eldest doesn’t. When my husband and I were kids we both played baseball and soccer. I’ve never questioned the benefits of organized sports. As a parent sitting on the sidelines, I now have a new perspective. There is nothing that brings a smile to my face like watching my daughter run after the soccer ball. Unless it’s seeing her make fast friendships with her team mates. While I whole heartedly believe in the benefits of free play, I beleive there is space for organized sports too. 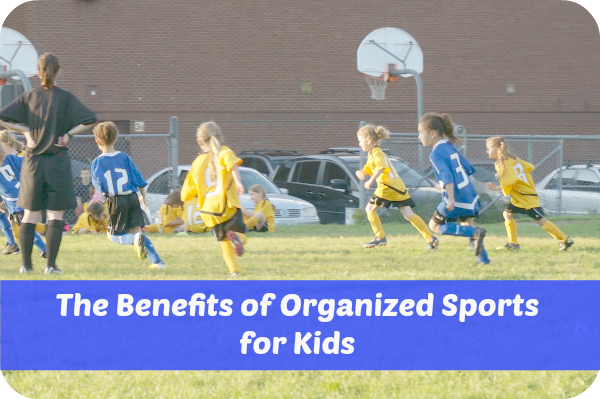 Here are just a few of the benefits of organized sports for kids. Teamwork ~ Teamwork is pretty fundamental in organized sports…passing the ball, taking turns on the field and working together toward a common goal are just a few ways kids learn about teamwork. Healthy Role Models ~ To this day I remember the coaches I had as a kid. Most coaches take on the position of positive role model for kids. Children need healthy role models like teachers, coaches and community members. Friendship ~ Week after week you go out to play a game together…week after week a friendship grows. If a friend on the team gets injured, kids display empathy and caring when they reach out to help the injured player. Physical Activity ~ This one is pretty obvious…kids reap the benefits of staying physically healthy when they play organized sports. Playing organized sports can lead children to develop healthy habits that will last their entire lives. Independence ~ Kids have to head out onto the field without mom and dad at their side…sport challenges kids to step out of their comfort zone and face challenges without their main safety net wrapped around them. Outdoor Play Time ~ In our busy lives it is sometimes necessary to schedule some time to be outside. Heading to the soccer pitch once a week is a great opportunity to get outside as a family. We love to head to the soccer pitch early, eat dinner and play in the grass before the game begins. Once a week we connect with the outdoors as a family…you can’t beat that. Of course, organized sports come with some challenges. It is important to do a little research and understand the expectations of the league your child will be joining. In my daughter’s soccer league they don’t keep score and the focus is placed on having fun. If your child has a more competitive spirit you might want to find a more competitive league. It is also very important to check your own motivation. Does your child want to play baseball…or do you want relive your childhood and make your child play baseball? Forcing kids into situations that they can’t cope with can hurt your child’s self esteem in the long run. If introduced in the right way and at the right age, organized sports can be a healthy part of childhood. Time for the party! Here are a couple of posts I enjoyed from the last Outdoor Play Party. 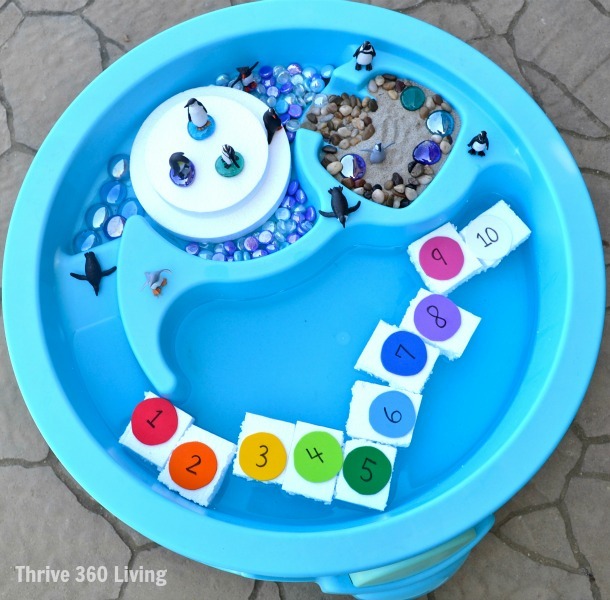 I simply adore this penguin small world play post from Thrive 360 Living. 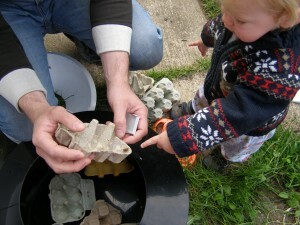 Mud Marvellous Mud’s moth traps look like an amazing summer activity.